It was announced last night at Bushiroad's press conference that DAIGO☆STARDUST will be starring in a new live-action TV drama, based on the Cardfight!! Vanguard trading card game. 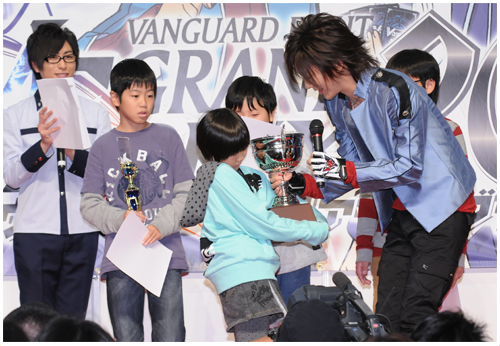 While little is known of the show at this time, DAIGO has in the past cosplayed as Sendou Aichi, protagonist of the anime and manga series. Vanguard has previously had one live-action production, but this was a children's TV show hosted by Doctor O, made to introduce kids to game tactics. DAIGO has previously starred in every Japanese commercial for the TCG, wearing his own custom fight gloves. His band was also responsible for a musical piece, "Climber x Climber" which was used in promoting the game. Of the known cast, it is public knowledge that the voice of Kourin, Mimori Suzuko, regularly cosplays as her own character. The drama will air on May 3rd from 8:30-10:00 AM on TV Tokyo. DAIGO will be joined by Sōma Shinta, Uchiyama Haruki, Mimori Suzuko, Nagasawa Nao, Namioka Kazuki, and Kanayama Kazuhiko. The director is to be Takahashi Motoki.